Sound "The large cabinet and moderately sized woofer of the Intimus 632-LR can move quite a bit of air, resulting in high volume with very little compression." "Bass extends down to the second octave, and does so with substantial heft." "Left-right soundstaging was continuous and believable, and the sense of depth was among the best I've heard at this price." "The Intimus 632-LRs paint their sonic pictures with a slightly muted palette, which manages to convey much of the detail while always remaining pleasing." rather than the ubiquitous medium-density fiberboard (MDF)." Drivers are " a 1" silk-dome tweeter, [and] a 6 1/2" long-throw carbon-fiber woofer." "The folks at Aperion feel strongly that speakers need to be auditioned in a customer's home. In order to facilitate this, Aperion pays for shipping, both ways if necessary, so the customer does not assume any risk." Use "These speakers are by no means unlistenable straight out of their boxes, but they do sound a bit stuffy and overdamped. Do not despair! After about 75 hours of Telarc cannons and the like, they open up a great deal. Aperion allows 30 days for your home audition, so you needn't be worried about taking the time to let the speakers loosen up." Value "Aperion has made it easy for you to hear the 632-LR in your own listening room at no additional cost. What do you have to lose?" I buy almost everything online -- from CDs to clothes, even some groceries. In many cases, it's not that I wouldn't rather go to a store to evaluate more thoroughly what I'm buying, but living in an area where nearly all of my shopping choices are big-box stores, I have a great deal of trouble finding what I want. Online shopping can also be more convenient for busy professionals, allowing us to shop at odd hours or on weekends. There are, of course, drawbacks. You wouldn't want to buy a pair of shoes online, as you'd have little idea whether they would fit properly. Websites like www.zappos.com have built that concern into their business model, including covering shipping both ways and not charging any restocking fee. So what does a pair of speakers have in common with a pair of shoes? Shoes have standard sizes to help you know whether or not they will fit you properly. Similarly, speakers have specifications. Just as anyone who has bought a pair of shoes knows, size is hardly the arbiter of a perfect fit. Accordingly, specifications can only give the barest idea of how a speaker might actually sound. Just as one needs to walk around a bit in a pair of shoes, only a prolonged trial over diverse musical terrain can tell one whether a pair of speakers fits -- or doesn't. Enter Aperion Audio, the Zappos of loudspeakers. Aperion was started in 1998 with the idea of selling directly to the customer as one of its tenets. Not only does direct selling remove the dealer markup, but the folks at Aperion feel strongly that speakers need to be auditioned in a customer's home. In order to facilitate this, Aperion pays for shipping, both ways if necessary, so the customer does not assume any risk. However, such a policy only makes business sense if a company can be sure that most customers will keep the product, so making good speakers is central to Aperion's survival. Aperion's product range covers the gambit of speaker size-- from diminutive satellites to large floorstanders and even a few subwoofers. The Intimus 632-LR speakers I received for review are large two-way minimonitors that could be used as the front-left and -right speakers in a complete home-theater system or run full range in a traditional stereo setup, as I used them. They cost $598 USD per pair, measure 15"H x 7 7/8"W x 12 3/4"D, and weigh a substantial 26 pounds each. Much of that weight comes from the use of inch-thick high-density fiberboard (HDF) for the cabinets, rather than the ubiquitous medium-density fiberboard (MDF). Instead of saying that HDF is less resonant than MDF, it might be more proper to state that it has a higher resonance frequency. The highly scientific knuckle-wrap test on the 632-LR's cabinet certainly produced a higher sound with faster decay and unquestionably sorer knuckles than with MDF. Other design features of the Intimus 632-LR are a 1" silk-dome tweeter, a 6 1/2" long-throw carbon-fiber woofer, five-way binding posts, and magnetic shielding. The Intimus 632-LR also incorporates Aperion's HD-X3 impedance leveling crossover. This technology is claimed to present a more even load to the amplifier than standard crossovers. However, constant impedance is a design goal with most crossovers, so the trademarked name should be largely ignored. The important thing is that the speaker actually does present a benign load, and Aperion seems to have accomplished the task here with a nominal impedance of 8 ohms and a minimum impedance that doesn't dip below 6 ohms (as read from the graph on Aperion's website). Frequency response is rated at 46Hz-20kHz, and the Intimus 632-LRs have a moderate sensitivity of 86dB/W/m. All in all, these are average specs, but would the sound be average? The Intimus 632-LRs arrived well packed in one large box with each speaker in its own box. Inside the individual boxes, each speaker was wrapped in a high-quality velvet bag. The first thing that anyone seeing the Intimus 632-LR for the first time will notice is the finish quality. The review pair came in a gloss black that was more lustrous than most pianos. For those who prefer, a medium cherry veneer is also available. The Intimus 632-LRs are nearly the same dimensions as my reference Amphion Argon2s, and looked at home perched atop 30"-high Plateau stands. The Aperion speakers are only single-wireable and were connected to my amplifier with eight-foot lengths of DH Labs Q-10 speaker cable. In my other reviews, I haven't spent a lot of time talking about break-in, because it is likely that a purchaser will have heard a demonstration unit at a local dealer. With a mail-order-only company, however, break-in becomes a much more important issue. When you get your new Aperion speakers, you'll want to hook them up right away and start evaluating them. Based on my experience with the Intimus 632-LRs, this will be met with rather poor results. These speakers are by no means unlistenable straight out of their boxes, but they do sound a bit stuffy and overdamped. Do not despair! After about 75 hours of Telarc cannons and the like, they open up a great deal. Aperion allows 30 days for your home audition, so you needn't be worried about taking the time to let the speakers loosen up. 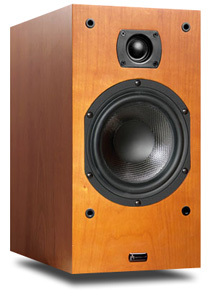 A large minimonitor can be a very good compromise for the space- or budget-constrained audiophile. Small-sized minimonitors can offer somewhat better image specificity, while large floorstanders can offer greater output and deeper bass. A large minimonitor can offer a bit of both, and in some cases enough of both to be extremely satisfying. The large cabinet and moderately sized woofer of the Intimus 632-LR can move quite a bit of air, resulting in high volume with very little compression. Orchestral crescendi are allowed to swell to their full climaxes, making works by Bruckner and Mahler much more satisfying than through other smaller speakers. Dynamic headroom isn't just about being able to play loud, but giving the music a sense of scale. I can't get as excited about an orchestra in miniature as I can about having the life-size thing in front of me. The Intimus 632-LR can't quite manage life size, but it comes far closer than most minimonitors. Loudspeakers  Amphion Argon2, Energy RC-10. Analog source  Michell Tecnodec turntable with modified Rega RB-300 tonearm and Shure V-15X cartridge, Trigon Audio Vanguard phono stage with Volcano power supply. Digital source  Mel Audio Rechav CD player. Interconnects  QED Silver Spiral, JPS Labs Superconductor. Power conditioner  Equitech Son of Q. That large cabinet doesn't just help with playing loud, though. Bass extends down to the second octave, and does so with substantial heft. Acoustic bass demonstrated good tunefulness and weightiness that gave jazz-trio recordings a presence not often heard through minimonitors. Bass drum and timpani showed good impact, but also had the tone associated with the body of the instrument. Devotees of organ music may still prefer a full-range speaker, but the Intimus 632-LRs gave a satisfying performance of the Saint-Saëns Symphony No. 3 "Organ" [RCA SACD 61387], providing both the foundation and power to make the fourth movement exhilarating. Even after break-in, the Intimus 632-LRs had a slightly damped character. That is, notes had a little less decay than I am accustomed to hearing. This blunted the sense of hall ambience that exists on many good recordings. There was still a sense of the hall, but it was a little less precise than what is absolutely possible. Certainly I prefer a little extra damping to the sloppiness that comes from an under-damped speaker. For listeners with more lively rooms than mine, this character could be judged a distinct asset. On any recording with a lot going on in the bass, the well-damped nature of the Intimus 632-LRs helped to keep notes very well in their places, and propelled the music along. So it seems as though the Intimus 632-LRs have many of those large-speaker pros, but they must give up some of those things that are great about minimonitors, right? Not quite. The imaging abilities of the Aperion speakers can put many other minimonitors to shame. Left-right soundstaging was continuous and believable, and the sense of depth was among the best I've heard at this price. While imaging isn't as important as the music itself, it can certainly add to the listening experience. I particularly took note of the Intimus 632-LRs' ability in this area on live opera recordings, such as Wagner's Der fliegende Holländer [EMI 7243 5 67406 2 4]. It's true that when I go to the opera, I can't get nearly as precise a sense of the singers' locations as is possible with a good stereo system, but those interactions among protagonists, discernible partially by their relative locations, are important in grasping the meaning beyond the words. Without those interactions, an opera is just a series of songs, not the wholistic art form that it can be. Through the Intimus 632-LRs, I could clearly hear when a singer was offstage. I could also hear the difference between two singers directing lines at each other and when they were singing simultaneous monologues. I listened to quite a few operas during my time with the Aperion speakers, because they were so good at communicating the whole performance. Who needs liner notes anyway? I don't have any firm opinions on the best materials to use for tweeter design. I figure that those decisions are part of the R&D that goes into building a speaker, and they are balanced against a number of other characteristics that aren't found on the spec sheet. So it's merely by coincidence that the Intimus 632-LR has the first silk-dome tweeter in quite a while to grace my listening room (actually the very first in this particular room). The top end of the Intimus 632-LRs is smooth and adequately extended. It lacks some of the sparkle of other speakers' treble region, but it thankfully doesn't exhibit much grain or hash. I wouldn't consider the Aperion speakers to be rolled off, just to have a little less energy in the upper treble than some other speakers. Brass instruments have a little less bite through these speakers than they do in real life, and string tones are somewhat more subdued. The Intimus 632-LRs paint their sonic pictures with a slightly muted palette, which manages to convey much of the detail while always remaining pleasing. The market for $600-per-pair minimonitors is pretty crowded right now. Back in February, I reviewed the Energy RC-10s and named them a Reviewers' Choice for the astounding value that they represent. At their retail price of $550 per pair, they make an excellent point of reference against which to judge Aperion's offering. Despite their smaller size, the RC-10s can reach down almost as low as the Intimus 632-LRs. Just hitting the frequencies isn't quite the whole story, though, and the Aperion speakers reproduce bass notes with a bit more authority than the little RC-10s. The larger volume also helps the Intimus 632-LRs play at substantially higher volume levels than the RC-10s without any noticeable signs of compression. While the RC-10s are well suited to a small-to-medium-sized room, the Intimus 632-LRs could be used in a largish room without being lost. A truly large room would require a full-sized floorstander, but there are very few audiophiles lucky enough to have such a room dedicated to music listening. For the majority of applications, the Intimus 632-LRs will be able to get the job done. They sound much bigger than their size would suggest, while I cannot say the same thing about the RC-10s. Both of these designs are soundstaging champs, but they have attained their titles in different ways. The RC-10s had a little more precision in their left-right imaging than did Intimus 632-LRs. The Aperion speakers countered with a deeper, more layered presentation that added to their sense of scale. Which speaker has the overall advantage in soundstaging abilities varies from recording to recording. The aspect of the RC-10s performance that really sets it apart from most other speakers is the ultra-smooth and extended treble. While high frequencies from the Intimus 632-LR are handled very well and are as smooth as could be wished for, they do not extend as far or exhibit the same refinement as those of the Energy speakers. The RC-10s have a considerably airier and more delicate extreme treble range than do many competitors with far higher prices. This additional refinement isn't only evident in the extreme top end, but manifests itself as a more varied tonal palette. Think of it as being able to discern five or six different oboes with the RC-10, while with the Intimus 632-LRs you can only manage two or three. Some more expensive designs can further differentiate instrumental timbres, while some of the speakers available at your local big-box store can't reproduce the difference between an oboe and a kazoo.. I've read before that musicians don't really care about hearing exactly how a particular instrument sounds; they are more interested in what is being played. The musicians I know, some of whom play in the world's top orchestras, wouldn't agree at all. It is the subtleties of tone and inflection that they've been working for years to perfect. They don't just play notes, and they're not interested in hearing other people just play notes. When I go to a live concert, I can hear those differences, and I want them from my audio system. The RC-10 is the more technically accomplished speaker for the refinement of its treble, but that doesn't mean that it is right for every listener or in every listening environment. If I had a large room or liked to listen at loud levels, then the additional power of the Intimus 632-LRs would more than make up for their less-delicate highs. Both pairs of speakers are capable of conveying the musical message, and do so in largely the same uncolored way. I've highlighted the differences, but they're really more a matter of degree than one speaker doing what the other does not. For anyone thinking of stepping up from a mass-market brand, though, either design will be an ear-opener. The folks at Aperion have designed an excellent large minimonitor with all-around performance that's as good as, or better than, most of its competition. The Intimus 632-LR's size gives it bass extension and output capabilities that smaller competitors can't match, and its smooth treble is especially welcome while listening at loud levels or to less-than-ideal recordings. That Aperion has made a speaker with a finish quality that's usually reserved for those at a higher price is only icing on the sonic cake. What's best of all, Aperion has made it easy for you to hear the 632-LR in your own listening room at no additional cost. What do you have to lose?